It is time for a kitchen makeover and you want the look you achieve to be up-to-date and to reflect your personal style. That means contemporary kitchen countertops are in your near future! The large number of countertop options can be confusing but also ensures that you can find the perfect solution for your needs. You just need to know the benefits and disadvantages for each option. Here’s how to choose the materials, shape, color and texture, and durability that are right for your contemporary kitchen and your family’s lifestyle and budget. Ready for a free estimate? Call us today at 410-712-0601 or click the button below to contact us online now! Choosing great contemporary countertops starts by choosing the right materials. While natural stones like marble are the traditional standard for great countertops, there are some man-made stones that are more economical. Most natural materials are extremely durable and unaffected by heat or cold (although the softer options like soapstone can be scratched). While they require a bit of maintenance (regular sealing is important), they can be a perfect, distinctive addition to a high-class contemporary kitchen. They offer less bulk, which means significantly less weight for the cabinets and structure to support and therefor allowing for a more streamlined cabinet structure. Thinner countertops maintain the clean, sharp look favored in a contemporary kitchen. Custom edging is also a great way to modernize the look of your kitchen countertops. Remember that crisp sharp lines and straight edges will make your countertops look sleek and stylish. Curved countertops and edges tend to look a little dated and fussy in the contemporary kitchen. In keeping with the geometric structural elegance of straight lines, designers are favoring grays, blacks, and whites for contemporary kitchen countertops. A neutral color pallet creates a warm ambiance and opens a lot of options in your other decorating choices. 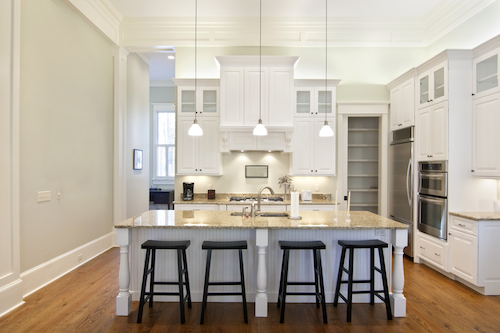 Echoing those neutrals in the cabinets, appliances and walls can create a harmonious look. Contrasting black countertops against white cabinets or using one restrained pop of color can create a dramatic look. Choose cabinets that have an aesthetically clean look to echo the sharp lines and angles of the countertops. Stainless steel appliances are a great choice to complete a contemporary look for your kitchen. The brushed silver of the metal harmonizes with the elemental quality of the neutrals. Limit the amount of additional clutter on surfaces and adornments on the walls. To maintain the elegant feel of your kitchen, try to avoid countertops that have many small appliances or decorations resting on them. Your beautiful contemporary countertop doesn’t need to be upstaged. Whatever contemporary kitchen design you choose to work with, modernized countertops will play a major role. By choosing a modern countertop with custom designed edging and the right colors to compliment your cabinets, you will go a long way to achieving the contemporary look you’re looking for. To receive your free estimate on kitchen or bathroom countertops, just give us a call today at 410-712-0601 or click here to complete our online request form. At Express Countertops, we are available to give you more tips, advice, and estimate your costs. We serve both residential and commercial customers in Maryland, Baltimore, Northern Virginia, DC and the neighboring areas. Once you know what you want, we can even install your new contemporary kitchen countertops within a week with our 7-Day Installation Guarantee.